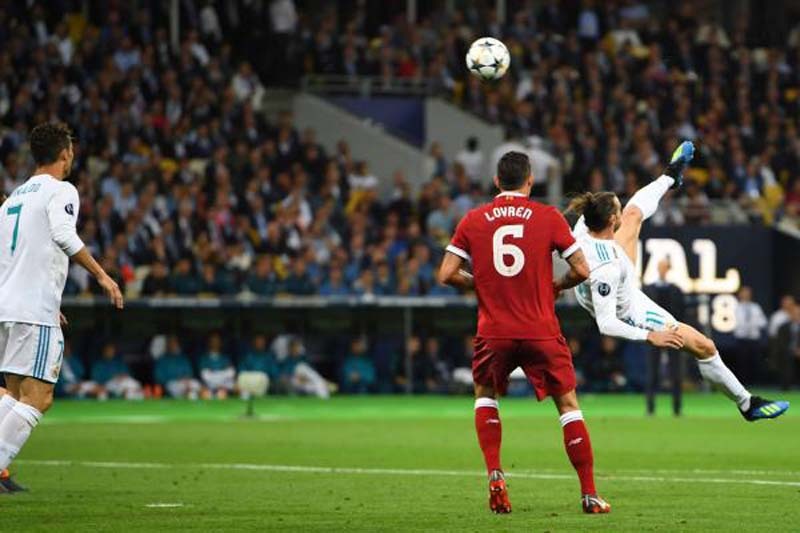 Real Madrid won its third consecutive Champions League final, beating Liverpool 3-1 Saturday at NSC Olimpiyskiy Stadium in Kiev, Ukraine. Gareth Bale starred as a substitute in the matchup between the La Liga power and its Premier League foe. He netted goals in the 63rd minute and the 83rd minute, securing the title for Madrid. But the biggest play of the game wasn't a score. It was an injury. Reds star Mohamed Salah left the pitch in the 25th minute. The Egyptian forward was battling for the ball with Sergio Ramos, when Ramos grabbed his arm and hooked it under his body. Salah suffered a shoulder injury and did not return to the match. Liverpool coach Jurgen Klopp called the ailment a "really serious injury" following the defeat. Karim Benzema put Madrid ahead with the first score of the game in the 51st minute. He did so by capitalizing on a Loris Karius blunder. The Liverpool goalie recovered a Madrid shot and attempted to throw it out to his right. Benzema intercepted the toss and deflected a shot into the net. Liverpool responded quickly, scoring in the 55th minute. Defender Dejan Lovren headed a corner kick toward the Madrid net on the play. Reds forward Sadio Mane tracked the flick and beat the defense to the ball. He then tapped a shot past Keylor Navas to tie the game. Then it was time for the super-sub Bale. The Welsh forward came on in the 61st minute. Three minutes later he netted perhaps the most beautiful goal of his decorated career. Marcelo dribbled just outside the Reds box on the play. The Brazilian then lofted a short cross into the box. Bale tracked back, before going airborne. He used a bicycle kick to rip the ball on net with his left foot. The shot sailed over a diving Karius for the go-ahead score. After some close calls from Liverpool, Madrid increased its lead. Bale brought in another cross from Marcelo in the 83rd minute. He took a few touches from about 35 yards out, before ripping a shot toward Karius. The Reds keeper blocked the shot initially, but deflected the ball into his own net, instead of securing the save. "We gave our all and have once again secured the title," Navas said after the match, according to RealMadrid.com. "We never lost faith, we always work hard. We're champions again and are extremely proud and grateful. There are always difficult moments, but we never lose faith and we draw on our strengths. We're here again and have been champions three times in a row. You have to enjoy the moment and then carry on. We never give up on winning any title." Madrid's next matchup is against Manchester United at 8 p.m. on July 31 at Hard Rock Stadium in Miami, Fla. Liverpool faces Borussia Dortmund at 4 p.m. on July 22 at Bank of America Stadium in Charlotte, N.C.
"I'm not fine, I'm the opposite of fine, but I try to be professional," Klopp told reporters. "I said it a few times, I'm turning 51 next month or so, I lost games in my life before, I won games in my life before - I know how to deal with that. What you cannot avoid is the feeling you have the night after the game. We all feel really, really bad, and the way home will not be the best trip we ever had in our life but we have to accept it now. We wanted everything and got nothing, or minus something with the injury of Mo." "He didn't play the final, we lost a very important player like probably Egypt lost a very important player. I still hope it's not like this, I have no idea [what] it is exactly, but all the medical department, what they said so far, it doesn't look really good. At the end, it's a football game, we tried everything to win it, that's why I wouldn't change anything in my preparations. I did the best I could and it was not good enough and I have to accept that, that's it."